Aicam Chuong has been a nurse at Holland Bloorview for over 30 years—first as a student, then working with children hospitalized here with complex medical conditions and acquired brain injury related to trauma or illness. She’s seen the hospital through four name changes and two sites. A patient recently dubbed her a vampire for the precision with which she always draws blood on the first poke. BLOOM: How did you get into the field? Aicam Chuong: When I was in high school I volunteered in a nursing home feeding the old folks. One day I was there when a code blue was called on the unit, and I saw doctors and nurses come, and each played a different role. One was starting the IV, one was documenting what was going on, one was giving medication orders. I thought ‘Wow, this is really interesting. I saw the dedication, and I thought maybe I want to do that. I went through a four-year nursing program in Nova Scotia and then moved to Toronto with my family. BLOOM: Why were you interested in children and rehab? Aicam Chuong: Children are fun. They recover more quickly than adults and they also open up and tell you what’s going on. A child may draw a picture about being sick and write ‘I want my mommy or daddy here,’ and sometimes parents have to work. I remember calling one mother and telling her: ‘I’ve told your son that you’re coming back after lunch, so you better come back, because I have to tell him the truth.’ I love working with kids. You can console them, you can give them a hug, you can carry them around. You can play games with them to make them happy. BLOOM: What is a typical day like on the brain injury unit? Aicam Chuong: I get my assignment of two to four patients and check in to read the report on how their night went. Then I go into Meditech and look at the care plan so I know how to provide care and get the medications. Some of the patients need extra tests or blood work. The kids are here for therapy, so it’s very important that they have breakfast and be ready for therapy on time. Time management is very important, and I want to make sure all of my patients get my attention. One of the patients said she was going to give me a name, and the name was vampire, because while some nurses didn’t get her blood with many pokes, I always got it with the first poke. We have to have fun sometimes with what we do! BLOOM: I think vampire is a great name to recognize your expertise with blood draws. Aicam Chuong: Something that helps us when we have to do invasive procedures is to work with our therapeutic clowns. They can come and distract the patient by doing something funny or singing a song. Our child-life specialists also help prepare our patients through play. That’s how our team works. BLOOM: What is the greatest joy of your work? Aicam Chuong: I’m happy to be here and I’m happy I can help the patient and the family. There’s one joyous thing in particular I remember. One of the patients had a head injury and was staying with us from up north. One day he came back from an appointment at SickKids and he and his mother were very upset and emotional. They had been told he probably wouldn’t regain his speech. But guess what? This patient comes to me one day and says ‘I want to learn Chinese and I want to learn Cantonese.’ I said ‘Okay, let’s start today, right now. I will take my break time—an hour a day—and I’m going to do this for you.’ We started with simple vocabulary and he learned one sentence each day. By the time he left, he could have a full conversation in Cantonese. One day in the parking lot a Chinese couple was having trouble with paying at the gate and he started talking Chinese with them and they said ‘You speak Chinese, but you’re Caucasian?’ He came back and told me ‘Guess what I just did?’ I said ‘I hope something good.’ He told me about helping the couple outside and it was amazing. His speaking tone was so accurate. His family was so appreciative and always come back to see us when they’re here for appointments. BLOOM: Was the patient able to speak again in English? Aicam Chuong: Yes. That was a very joyous story. He gained back his language and he also learned Cantonese. BLOOM: What is the greatest challenge? Aicam Chuong: When families come in after their child has had a sudden trauma—like a car accident—or a tumour has been diagnosed. They don’t know what’s going on, or what will happen. The challenge as a nurse is to be present for them, to do active listening and to figure out what they most need help with right now. 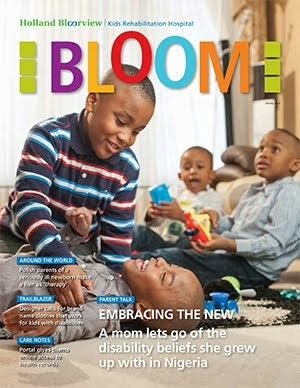 BLOOM: I assume some families are very distraught and it must be hard to be on the receiving end of that pain. Aicam Chuong: We are here for the family. When I’m here, it’s not just my body, but my mind and my heart. The heart is very important. BLOOM: What about when you’re incredibly busy? Aicam Chuong: We make time. I would rather have a 10-minute break than an hour if that can help the family. We tell them it’s a partnership. I may suggest spending an hour or two with their son or daughter so they can go have a shower or go down to Tim Horton’s for a coffee. BLOOM: What emotions come with the job? Aicam Chuong: Joy, caring, understanding. Sometimes I feel helpless if there’s something we can't do and we have to transfer the patient back to SickKids or another hospital. But when I don’t have the solution to something, I go to my manager and my colleagues for help. We are a team and we stick together. BLOOM: Do you do anything to manage stress? Aicam Chuong: I exercise. I go swimming five to six days a week in the community. I do Aquafit and then I go sit in the sauna and get all of the sweat out. If I work a day shift, I swim in the evening. If I work an evening shift I swim in the day. It makes a big difference. I also listen to classical Chinese music. It relaxes my mind. BLOOM: You’ve had such a long career here. What keeps you coming back? Aicam Chuong: We can make a big difference in the kids’ lives and that’s what makes me stay. It’s very rewarding. BLOOM: If you could change one thing about children’s rehab, what would it be? Aicam Chuong: We see so many kids who come to us after trauma. I think we need better psychological support on the unit for patients and their families. Children and parents need someone to spend more time talking with them. If a parent comes out of a meeting where the news was not good, they cry, and they need to talk about it. It’s hard to do that and devote equal time to all of your patients. Aicam was a lovely nurse that was upbeat and cheerful while honest about the needs of the patients (my son in this case). It's true about the blood being drawn. If Aicam couldn't do it, no one could on our little baby! She's the expert. Congratulations on this lovely story, Aicam! It highlights how care, devotion, and attention has a positive impact on the rehab journey of clients and their families. Aicam, a very special thank you to you and to your colleagues in nursing for everything you do to care for our clients and families. Your hard work reaps high rewards! You are Forence Nightingale and Mother Teresa put together at Holland Bloorview. You are the role model for nurses, an interprofessional collaborator and a good soul who is living her dream life in finding happiness by giving herself to others. I wish you many more years of giving, great health and happiness. Your work is impactful and you are leaving behind a legacy. I am proud of your achievements. Congratulations on this well deserved recognition.